The "Yes Men" perform stunts to "fix the world." Humorous hijinks might not seem to have much of a place amid the weighty and often acrimonious policy debates taking place across the country these days. But liberal pranksters Andy Bichlbaum and Mike Bonanno -- known as the "Yes Men" -- believe having fun and being funny are both legitimate and necessary components of lobbying for their political causes. Bichlbaum, 44, a teacher at Parsons The New School for Design in New York City, and Bonanno, 42, a professor of media arts at Rensselaer Polytechnic Institute in Troy, N.Y., undertake bold pranks on corporate giants and political icons in legal -- but perhaps morally questionable -- attempts to publicly humiliate them into changing their ways. The duo has infamously impersonated corporate spokesmen on international TV, distributed more than a million counterfeit New York Times newspapers, launched imposter Web sites to contradict their opponents' and even chased after a Democratic senator in outrageous costumes to try to embarrass him. In their most recent scheme -- holding a phony news conference under the banner of the U.S. Chamber of Commerce -- Bichlbaum masqueraded as a Chamber spokesman to announce a dramatic reversal in the group's stance on pending climate change legislation. The so-called news was broadcast by several cable news outlets before it confused reporters and was refuted by angry Chamber officials. The Chamber has now sued the duo, accusing them of trademark and copyright infringement. The Yes Men's ploys, which are videotaped and posted online, have amassed a sizable following through blogs and social media. Their two independent films, collections of the duo's most famous pranks, have won over audiences at international film festivals. The latest film, "Yes Men Fix the World," is rolling out in theaters across the country. But to many of Bichlbaum's and Bonanno's targets, their antics are not a laughing matter. The mixed messages sown by a prank can create an embarrassing and sometimes damaging public relations nightmare that's hard to prevent and counteract. The U.S. Chamber of Commerce said the Yes Men hoax distracted from the "genuine effort to find solutions on the challenge of climate change." The Chamber also said it was asking law enforcement to investigate the incident for criminal wrongdoing. For their part, Bichlbaum and Bonanno are confident in the legality of their tactics and say they have never been prosecuted for a crime. "We want to promote the idea of direct-action protest, putting your body on the line," Bonanno said. "But this is a way to do it that's really funny that people aren't accustomed to. You think of direct-action protestors as people who go around breaking windows. But, really, it can be fun and funny ... we want to promote this idea that we should be out there doing things, acting on our ideals." One of the duo's more notorious pranks came in December 2004 when Bichlbaum impersonated a Dow Chemical spokesman in an interview on BBC World and BBC News 24. During the live broadcast, Bichlbaum announced that Dow would fund a $12 billion compensation package for victims of the Union Carbide chemical disaster that killed thousands in Bhopal, India, in 1984. Although Dow never owned or operated the plant involved in the accident, Dow acquired Union Carbide in 2001 and had said it bears no responsibility for Bhopal. The company's apparent about-face, at the hands of the Yes Men, caused Dow's stock to plummet by more than 3 percent in European markets in the hours before the fraud was exposed. BBC later retracted the story and apologized to Dow. "The interview was inaccurate, part of an elaborate deception," BBC said in a statement read on the air. "We want to make it clear the information he gave was entirely inaccurate." Dow would not comment on what actions, if any, the company considered taking against the Yes Men or the BBC. Bichlbaum and Bonanno met through a mutual friend in 1997 and began collaborating when they launched a Web site for fellow liberal activists. Two years later, the two perpetrated their first prank: a mock Web site for the World Trade Organization, which was meeting in Seattle, Wash., at the time. "We couldn't make it to Seattle, but we felt an affinity to the protests," Bonanno said of the site. "We knew we were onto something when we started getting e-mails from people who thought our site really was the WTO." In the years that followed, Bichlbaum and Bonanno continued their subversion primarily by creating mock Web sites to spread their message. Many of them are still accessible online. But over time, as search engines improved to filter out illegitimate sites, the pair say they had to get more creative. 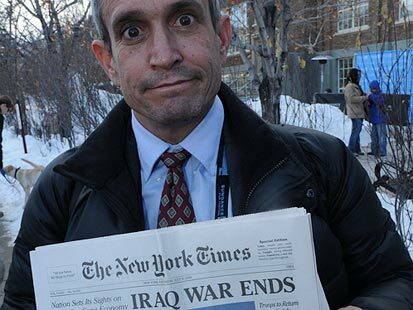 In November 2008, the Yes Men published more than a million copies of a fake New York Times . The spoofed papers, dated July 4, 2009, were distributed on the streets of New York City with the headline "Iraq War Ends." "I think it captured a lot of people's imaginations about what is possible if we set our minds to it," Bonanno said. Provoking thought about an assortment of social issues, including greater corporate responsibility, ending war and protecting the environment, is at the heart of their mission, the men say. Bonanno said he and Bichlbaum decided to call themselves the Yes Men to reflect "the idea of the person who agrees with anything the boss says, no matter how stupid, or violent, or nasty it is, just to get ahead." "We thought it would be a good name ... because, essentially, when we infiltrate these organizations, we try to set them up by saying things that often agree with what's already in the room but make it absurd." Lately, Bichlbaum and Bonanno have turned the absurd on the issue of global climate change. 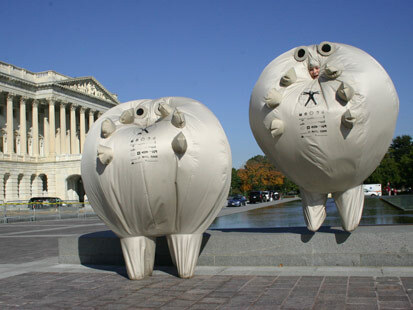 The Yes Men mascot, an inflated, amoeba-like caricature that they call the "Survivaball," is a spoof of what might be necessary to survive the "climate change impacts, including droughts, floods, tornadoes, and even food shortages," according to the Survivaballs' Web site. The men hope the ridiculous objects will highlight the need for Congress to act. "The Survivaball was our fanciful answer, our couture for climate calamity," Bonanno said. "We based it on a one-celled organism. Then, it evolved into something a little more like a bloated tick." Bichlbaum and Bananno caused a stir in February at a BMW charity gala in Berlin. The pair snuck onto the red carpet wearing large inflatable costumes and sat down blocking the path to the entrance. "We won't move until BMW stops making cars," Bonanno declared. Carbon emissions are "killing the planet," he added. Video of the incident shows the men playfully interacting with event organizers before being nudged off the carpet and back behind a fence surrounding the area. Law enforcement was not involved. The phony U.S. Chamber of Commerce news conference in Washington last week began with a news release Bichlbaum and Bonanno posted online. To the naked eye, the electronic document looks strikingly similar to other official Chamber correspondence. In reality, it was a fraud. "We at the Chamber have tried to keep climate science from interfering with business," the fake release read, "but without a stable climate, there will be no business. ... There is only one sound way to do business: that's to support a strong climate-change bill quickly." In a rented room at the National Press Club, Bichlbaum hosted a news conference where nearly a dozen members of the media took notes on word that the Chamber would now be supporting Democratic-sponsored proposals to address climate change. During the question period, Eric Wohlschlegel, a real representative of the Chamber, burst into the room, decrying the "fraudulent press conference." "I'm with the U.S. Chamber of Commerce. This is not an official U.S. Chamber of Commerce event," he told the room full of reporters while pointing to Bichlbaum behind the podium. "I work for the U.S. Chamber and you don't look familiar to me at all. ... Can I see your business card?" Many reporters were bewildered by the situation. 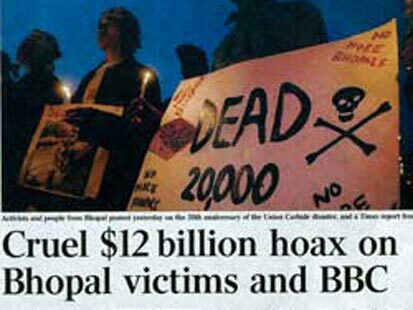 But before the hoax was uncovered, some had already relayed the phony news to their organizations. Reuters, Fox Business Channel, CNBC and other news outlets issued "breaking news alerts" to say the Chamber had reversed its position on cap-and-trade while, in reality, nothing had changed at all. The news services later retracted the story and issued corrections. U.S. Chamber president Thomas J. Donohue, who has publicly expressed his group's support for efforts to reduce greenhouse gases, opposes the pending legislative proposals. "Some in the environmental movement claim that, because of our opposition to a specific bill or approach, we must be opposed to all efforts to reduce greenhouse gases, or that we deny the existence of any problem," Donohue said in a Sept. 29 statement. "They are dead wrong." The Chamber last week issued a take-down notice under the Digital Millenium Copyright Act to the Internet service provider hosting the Yes Men's electronic news release. The site was down for several hours but later restored. In a suit filed late Monday in U.S. District Court, the Chamber alleges the Yes Men's prank was "destructive of public discourse, and cannot be tolerated under the law." "The defendants are not merry pranksters tweaking the establishment," said the Chamber in a press release issued with the suit. "Instead, they deliberately broke the law in order to further commercial interest in their books, movies, and other merchandise." The suit says Bichlbaum and Bonanno used the prank to essentially promote their movie currently in theaters, making them guilty of trademark infringement, unfair competition and false advertising. For their part, the Yes Men insist what they do is legal. They are represented by the Electronic Fronteir Foundation. "The websites are critical of the companies, but it's protected free speech," Bonanno said. Several legal experts told ABC News that while there are several areas of law that could be used to challenge the Yes Men, it is going to be a difficult case to make. "Intellectual property owners have shown themselves to be aggressive in using IP rights as a tool to suppress criticism. ... But they're not immunized from criticism," said Roger Schechter, a copyright, trademark and intellectual property law professor at George Washington University. "Virtually every one of [the possible legal arguments against the Yes Men] is subject to being trumped by First Amendment arguments," he said.